Yesterday I pointed out how Donald Trump has falsely tried to blame “both sides” including the “alt-left” for the violence in Charlottesville, when in reality there is no equivalency between these white supremacists groups and those who came out to stand up to them. 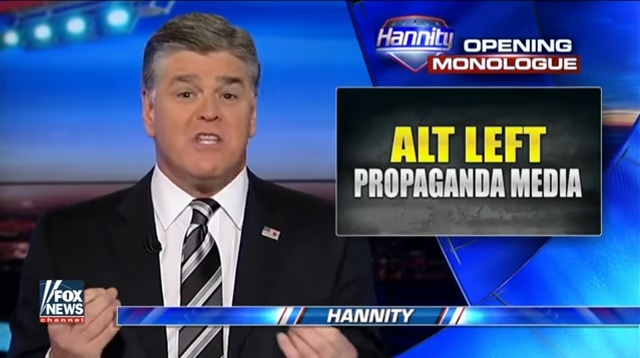 The alt-left is a concept created by the far right in order to create a false equivalency, and unfortunately many establishment Democrats have joined them in this bogus attack on the left. Some centrist liberals have taken to using this term. On Tuesday, Mr. Trump said the “alt-left” was partly to blame for the Charlottesville violence, during which a counterprotester, Heather D. Heyer, was killed. Of course there is noting comparable on the left to the white supremacist views of the alt-right, and only one side committed murder last weekend. But if you pay attention to a number of prominent liberals and Democrats, you would think the American left poses some existential threat to the United States. I generally agree with this article except that I disagree with calling supporters of the Democratic establishment liberal. I do not consider Hillary Clinton or those who supported her to be liberal. I know many on the left have abandoned the term liberal because of its misuse, first by the right, and now by establishment Democrats. I have preferred to stick with the term due to his long standing historical meaning. Therefore I stood up for liberalism when the right distorted its meaning, and now do the same when establishment Democrats tarnish the word by misusing it to describe their conservative views. Of course I do have some interest in preserving the honor of the term liberal, having had a blog with the term in the title for over a decade. Unfortunately the liberal values which this blog has defended from the start, generally from Republicans, are now under attack from the Democratic establishment. Posted in Democrats, Donald Trump. Tags: Democrats, Donald Trump, Hillary Clinton, Racism, Sean Hannity. RSS feed for comments on this post.. TrackBack URL. The antifa exists, so "alt-left" isn't entirely fabricated to create a false equivalency. Crowd pshychology being what it is, I think we know that at least a couple skirmishes over the weekend were started by the "left". I don't mean to suggest an equivalency between murder and a fist fight. I prefer to ditch the term liberal, as it no longer has any coherent meaning. (If Hillary is a liberal, then up is down, black is white, slavery is freedom, etc.) I prefer the terms Progressive and Republican-Lite to distinguish the Sanders wing from the Hillary wing.